They are an ancient group of plants with large attractive foliage, and as a low care plant have found a home in many landscape features around the world. 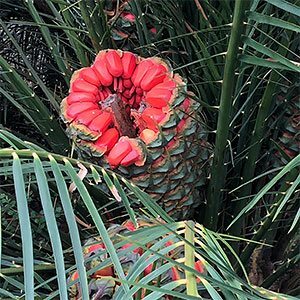 Widely distributed, cycad species are native to both Africa (Encephalartos hildebrandtii and others) Japan (Cycas revoluta) and Australia and many are prized not only as ornamental plants but also as a source of food and for medicinal qualities. Cycad species from Australia include : C.thouarsii is a tall growing species to 10m +, C. ophiolitica from Queensland is a rare low growing plant, C.media is another from Queensland, tall growing and looking like a palm tree, C. megacarpa is a medium sized cocas reaching 5 -7m with a stout trunk, C.platyphylla is a prostrate cycad, C.armstrongii is from the Northern Territory, C.cairnsiana is endangered, it will reach 4m under ideal conditions. Lepidozamia peroffskyana and Lepidozamia hopei which are two of the tallest of all cycads are others. We are often asked about leaves on cycads turning yellow, this seems to be a particular problem with potted plants. The usual cause is overwatering, or over fertilising and sometimes to much sun. The yellow leaves will not ‘turn green’ again, we suggest you check soil moisture, and also check for poor soil and poor drainage, also look at how much fertiliser you are using. Scale and mealy bugs are about the only pests to worry about, so check for these as well, lots of solutions available at your local nursery for these problems. Love your cycad, take it with you, transplanting Cycads is not difficult and they seem to survive well if large enough root ball is taken. A little unusual for a cycad, Cycas Ceratozamia has no prickly spines, making them one of the easier species for high traffic areas. A rather small growing species from mexico it has broad leaflets and will arch a height of only.6m, remember that this a slow grower like most cycads. New foliage emerges a bronze and quickly turns to a bright green going deeper olive green with age. An understory plant from the mountainous regions of mexico it is drought and frost tolerant. Part shade is best, and certain/y some protection from the hot afternoon sun in all but the coolest regions of Australia. 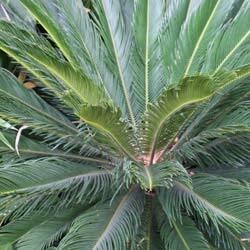 This is large cycad from Mozambique and neighbouring areas. Actually one of the best for Australian conditions as it copes well in sunny positions. The long foliage is spiny and holly like, reaching around 1m giving the plant a 2m spread. Large cones (often a bright orange) are either male or female, the male cones being being longer, while the female cones are more rounded. This species will reach around 2m in height and with the spiny foliage is best planted away from high traffic areas. Although it does like a little warmth Cycas Encephalartos ferox is best in part shade. Moist conditions, but well drained. Propagation is from seed or from offsets, from seed germination is rather slow, 6 – 8 months, a long tap root forms first so if growing in a container make it a deep one. Another ‘upright’ species originally from Kenya and surrounding areas. Faster growing than many others it can reach a height of 4 – 5m over time. As with many cycads, dapples shade is best, a humus rich deep soil will allow the long tap root to develop and provide the plant with moisture and strength although some landscapers do grow then in containers, we do not recommend it with this one. Although it can cope with light frosts Cycas Encephalartos kisambo will not do well in a heavy frost. An interesting species from the Sudan to Uganda, often more upright than other species Cycas Encephalartos septentrionalis has a silvery grey green foliage that can stand 2m tall. Another species with spines on the leaves, but smaller than some. Over time as the old foliage dies it will form a stem, sometimes they will drop all of their foliage in winter. Not frost tolerant and not widely grown as a landscape plant.